The Civil War caused numerous monetary problems, such as a lack of fractioned money. The Department of Finances of the Generalitat de Catalunya, directed by Josep Tarradellas, so as to provide a response, presented a decree in September 1936 for an ambitious plan to issue monetary notes of legal tender throughout Catalonia. The idea was to create an authentic Catalan monetary system with all the necessary values, with the endorsement of the treasury of the Generalitat independent of the Bank of Spain, of which the Government of the Republic ended up prohibiting in 1938. Various values were projected of which the only ones to be put into circulation were the notes of 2, 5 and pesetas. The design was commissioned to the noucentista artist Josep Obiols  and was printed in the Institut Gràfic Oliva of Vilanova i la Geltrú with special security paper with watermarks. 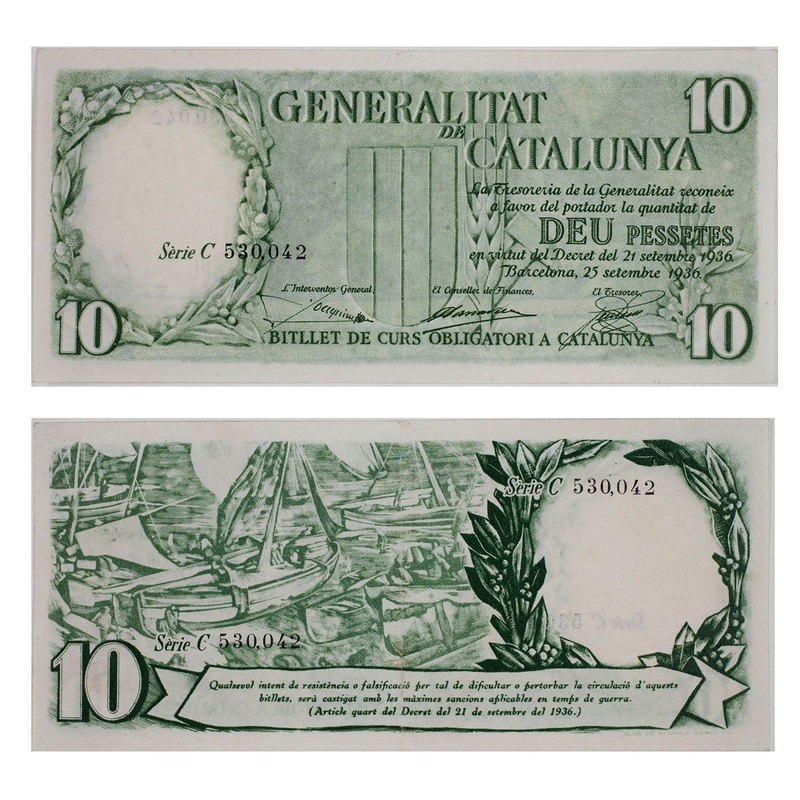 The 10 peseta note was printed in two tones of green and on the back were represented fishing boats while on the front it showed the coat of arms of Catalonia next to an ear of corn and a hammer - allegories of agriculture and industry, with various ornaments of laurel branches and of oak.